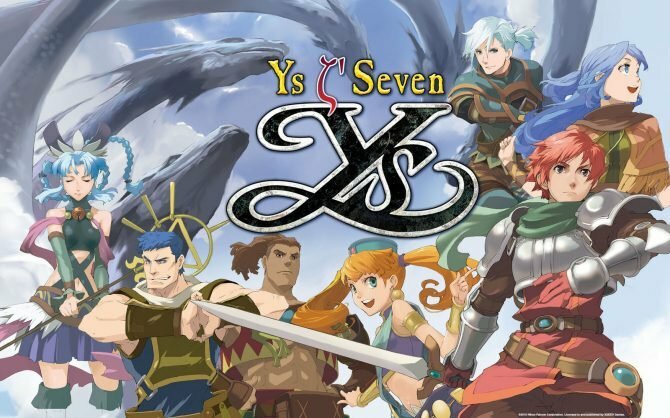 I went into Ys Seven with few expectations, and even less knowledge of the entire franchise than I wanted. Needless to say, it was an RPG and I’m all for trying new RPGs. This one was no different. 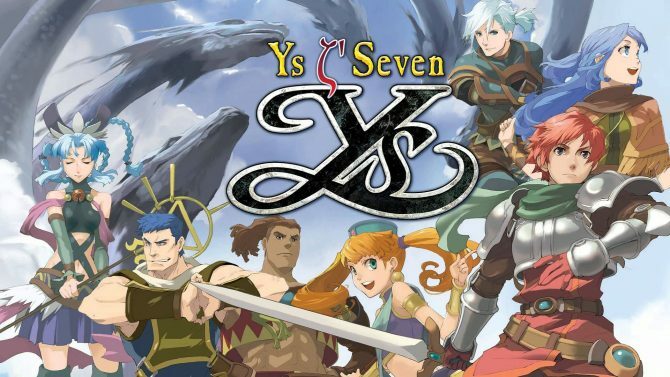 The Ys franchise has been around for a long time and, unlike other RPG franchises, this one sticks mostly with the same characters, just different stories in each title. 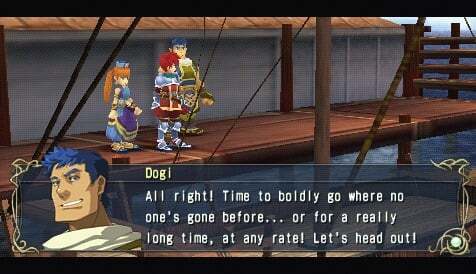 Here we have the series’ main character, Adol, and his friend Dogi (is that pronounced like “doggie”?) arriving on a new land via boat. What is your goal? To search for treasures, of course. Not being a series regular, so to speak, I didn’t quite know what was going on, as the dialog didn’t seem too cognizant that some players may not have played previous games. 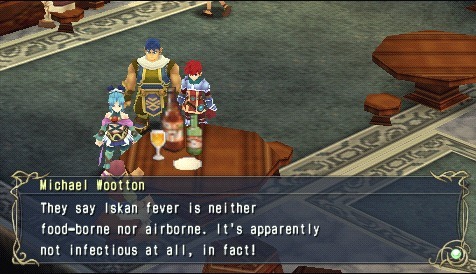 While the story is unique to this title, I just didn’t “get” all the character interactions between Adol and Dogi because I hadn’t played previous titles in the series. But, all that really isn’t needed to enjoy this game. The duo disembark from the boat in a city on the continent of Altego. What seems like a standard visit soon turns into a wild and wacky quest, which isn’t too far- fetched for an RPG of this sort. Because Adol’s reputation precedes him, he’s asked by the king of the land to check out some strange goings on in the surrounding territory. 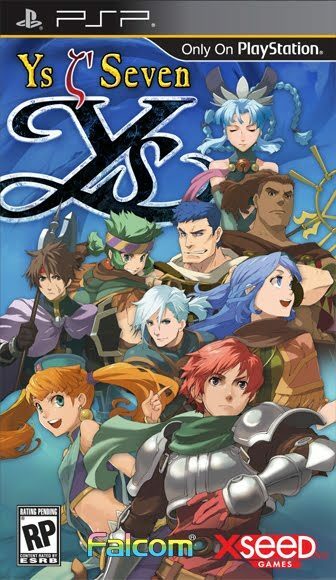 The story has many light-hearted moments, and seems more oriented at having fun than making you think or connect to the characters, yet the dialog back and forth, especially between Adol and Dogi, is charming and likable all the same. There are some really touching characters moments, especially early on, that stood out to me. It reminded me that sometimes it is the simplistic, raw emotions that connect you to relatable characters and situations more than anything else. I suppose it took a more simple, light-hearted RPG to get me to remember that, but hey, I count that as a positive. There is no voice work here, besides a few lines during battle and when you switch characters out in the field. That may be a good thing in this case, as it brought back that classic RPG feel of reading the dialog and putting your own voices with the characters. The other audio is pretty top-notch, from the music to the sound effects in battle. The visuals are also fairly appealing, if not outstanding. This is a PSP game, after all, but it still carries a playful, eye-catching quality that sometimes we forget about when assessing games of this genre. What really stood out for me – and what added the most to this fun title – was the battles. Things are very simple – press one button to attack and another to dodge, or roll away. That is the basis of this action battle system. You see the enemies right on the screen – there is no loading to a battle screen, no turn-based system and no complex control mechanism. However, I wouldn’t want to give the impression that the battle system is that superficial. It does have some deeper elements to it. If you enjoyed the ability-learning system from Final Fantasy IX, you’ll enjoy the way things are set up here. Each weapon or piece of gear has certain abilities attached to it, which progress in level the more you use them. After the ability levels up once, you no longer have to have that item equipped to use it, so you can accumulate a massive amount of abilities and pick and choose which ones you want equipped at any given time. Even though you can only equip four at a time, there is still a huge variety of combinations for seemingly every single situation. These special abilities rely on a certain meter that fills up as you kill enemies or perform other actions on the field. You even help fill this meter up by cutting down tall grass and being attacked in battle. A separate meter regulates how often you can use a super-powerful attack that tends to show more difficult enemies who’s boss. This one refills similar to the first, although not as quickly, so timing its use is of great importance. Each character has a different set of weapons that they tend to use, and these weapons produce different types of attacks. 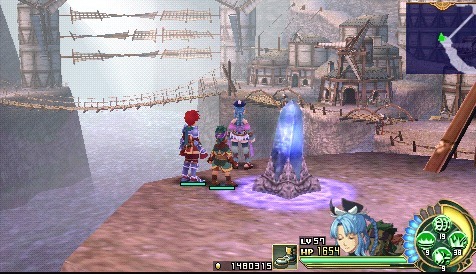 Adol and his sword, for example, are best used on softer monsters, while Dogi and his fist weapons can crack the hardened exterior of monsters with shells. What will benefit you most is to know what enemies are predominant in the area you’re fighting in and focus on using characters to that damage them the most. This is easily accomplished by the party member switching system, which is as easy as hitting the circle button on the field screen to cycle through the three active characters. Boss battles are an entirely different affair. While not astonishingly difficult, they do provide a markedly superior challenge than the surrounding enemies. Each one also tends to have some sort of gimmick you must take advantage of to defeat, however it never feels like these gimmicks are put there just to annoy you. The boss battles really require you to focus, so as to learn the pattern the boss follows, as well as adapt to changes in this pattern. Typically after a certain amount of health is lost, the boss goes all crazy on you and switches things up, doubling its attempts to end your journey prematurely. I always felt a certain sense of satisfaction after I cleared a boss, simply because it does take a bit of thinking to come out victorious. Aside from all that, there is also a weapon upgrading system, which works hand in hand with gathering items in the field. I found that many times upgrading your current weapon is more cost effective than purchasing a new one every time you turn around. Of course, eventually that new weapon purchase will be performed, but the hidden gem of it all are these weapon and armor upgrades, that provide sometimes higher stats than a new item which costs ten times as much. One other thing I really enjoyed about Ys Seven is that it has a “save anywhere” feature. There are crystals at various points where pre-defined save points would probably be located (such as right before a boss fight or right outside of town), but these merely serve as refill stations, to fill up your heath and mana, as well as cure any status effects your characters may be dealing with. Once you do that, you can save on your own, anywhere you desire and as often as you feel you need to. There are a couple unfortunate issues with this title, however. I briefly mentioned one minor issue, and that is that the game isn’t conducive to new players who are unfamiliar with what came before in the franchise. Although, it is a plus that, to understand the present story, that prior knowledge isn’t necessarily needed. Another, much larger, issue I had was the lack of direction at many points throughout the game. I clocked in 28 hours total to complete the game, but I feel I probably could have done it in around 20 had I not had to wander around aimlessly at various parts of the game trying to figure out where to go next. This is especially the case near the beginning of the game. For example, about 10 minutes into the game you’re dropped off in a city and…that’s it. You’re not told where to go or what to do. I wandered around that city for close to an hour, talking to everyone – sometimes multiple times – until a cut scene finally triggered. The odd part is that I have no idea what I did to trigger it, because I had passed by that same exact spot at least twice before this. This trend continues through the game, although sometimes it is significantly less annoying. To some degree this lends itself to exploration, but there is a line that shouldn’t be crossed, and across that line is the realm of tediousness. Unfortunately, Ys Seven tends to cross that line more than I would like. Aside from that, there are some annoying targeting issues during battle situations, especially when you’re using ranged characters. Attacks also sometimes take a while to be performed and in that time enemies may move so that your attack goes off and hits nothing but thin air. This is especially annoying when it is one of the uber special attacks with a meter that takes a while to refill. This happened more than once during a boss fight, which puts quite a dampener on the encounter overall. 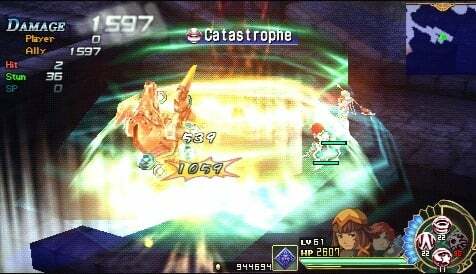 Other than that, Ys Seven is a great RPG that balances fun with a fairly deep, rewarding battle system. While nothing is outstanding here, fans of the franchise, and JRPGs in general, will find little to dislike. I really enjoyed the ease of use of this action battle system, not being too convoluted or hard to control. It was simple and effective. The story definitely won’t get many people talking, but it, as well, is simple and light-hearted. Somehow the combination of these things – the fun battle system and simplistic, yet entertaining story – make this game one that I had a hard time putting down. Review Copy Info: A download code was provided to DualShockers Inc. by the publisher for purposes of this review.